MyCube Vault is a new tool for backing up your content on different social media sites,or as the company puts it in the press release, “the first of a suite of services that will give users complete control of their online lives”. It is the brain child of internet entrepreneur Johan Staël von Holstein, who presented the Vault this morning at a meeting in Stockholm. The tool allows users to take ownership and control of content they have shared on social networks such as Facebook. The reasoning behind the need for this procedure is that MyCube predicts an increasing need for users to be in charge of their content, in terms of privacy, security and control. Who really owns your data on social networks will be a critical issue in the future, MyCube assumes. In January next year, MyCube will also launch a beta of MyCube Exchange, a social network that will let users create and share content, not only on MyCube, but also on other sites. In other words, the plan seems to be to allow users to download all of their content with MyCube Vault, upload it to MyCube Exchange and then share it to all the places they choose. This will give users more control and in the long run an option to actually leave sites like Facebook and take all that content to some other place. The Vault is an open source project and free of charge for users who use the tool to download their content to their own computer. So far, the only service you can back up is Facebook, which of course you can already do directly inside Facebook. Hopefully more services will be added shortly. This is how you back up your Facebook content, using MyCube Vault. Give the application access to your Facebook account. 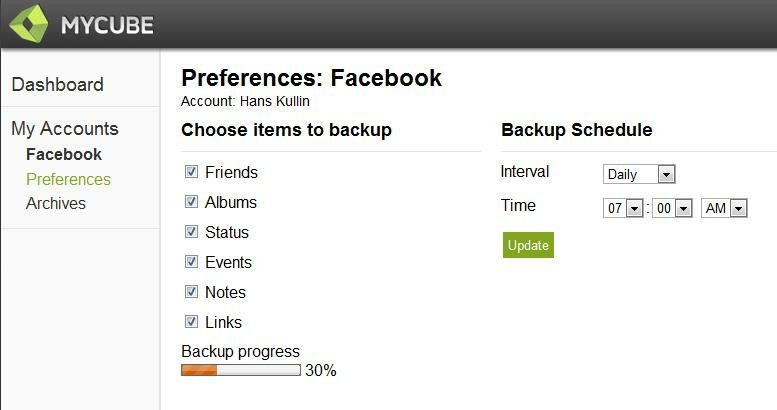 Then backup your friends, albums, statuses, events, links and/or notes. You can also let MyCube Vault do a backup on a daily or weekly basis. 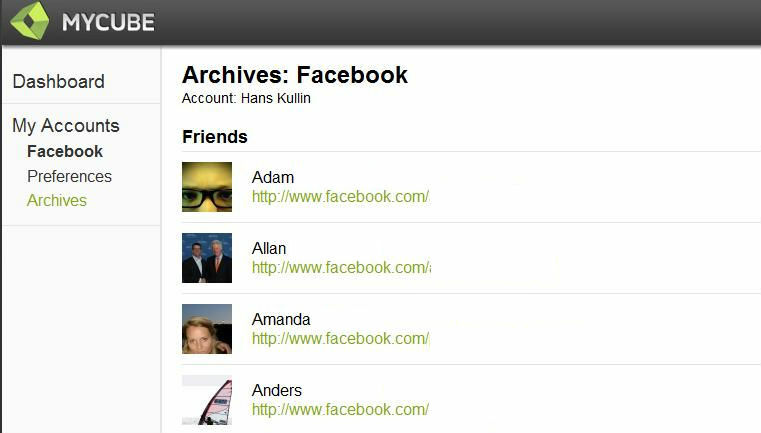 The Vault then downloads your content, for example the names of all your friends and a link to their profiles (I have erased their last names and full links in the image below). Status updates are downloaded, including comments. A question that MyCube will probably face is the definition of who actually owns content. For example, I downloaded “my” content on Facebook but not only did the Vault download all my photos, it also downloaded all photos I am tagged in, which of course includes photos that aren’t mine.